March 16, 2017, Adrian, Michigan – George Heartwell, former Mayor of Grand Rapids, Michigan, spent the day March 15 speaking to residents and leaders of Adrian about ways to build a resilient, sustainable community in light of the ramifications of global climate change. 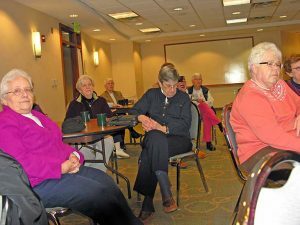 Sisters and Adrian community members listen to George Heartwell’s presentation in the Common Room at Weber Center March 15. Mr. Heartwell emphasized that global climate change is “the most urgent and pressing problem facing humankind today.” Mayors and other leaders of local communities worldwide play a special role in mitigating climate change, he noted. While national and state leaders focus on more abstract areas, such as their party’s ideology, mayors must deal with more down-to-earth issues: helping their communities through heat waves, crop loss, and the effects of extreme storms. In recent years, mayors also became aware of the need to adapt to situations already brought about by climate change. “There are still enormous impacts to climate that will affect us for decades, likely generations, to come,” Mr. Heartwell noted. Communities need to make adaptations to these conditions. Mr. Heartwell represented Grand Rapids as one of five U.S. cities and five European cities that were invited by the International Organization of Cities to develop a model for climate adaptation and resiliency for cities. He was also invited to be part of a White House taskforce to work on community resilience to climate change. The taskforce presented President Obama with 75 strategies for resilient communities facing climate change. “We concluded that many of the initiatives that worked for adaptation were the very things that were needed in the long run for mitigating climate change,” Mr. Heartwell explained. President Obama in turn issued executive orders in response to those recommendations. The election of President Trump has brought some reason for discouragement, Mr. Heartwell said, noting the president’s denial of climate change is reflected in his appointments to head such vital organizations as the Environmental Protection Agency. Still, he remains hopeful. “One of the uncontainable forces that has been unleashed during the Obama administration is the power of local government to act in the best interests of its citizens,” he said. “No mayor is going to cave to the federal government if she feels that her citizens are at risk.” Mayors will continue to find newer and creative ways to protect their citizens from the effects of climate change.